Spring’s hit London! And I have yet more jeans to show you. Sorry. At least they’re a new pattern and a slightly different shape to previous pairs! 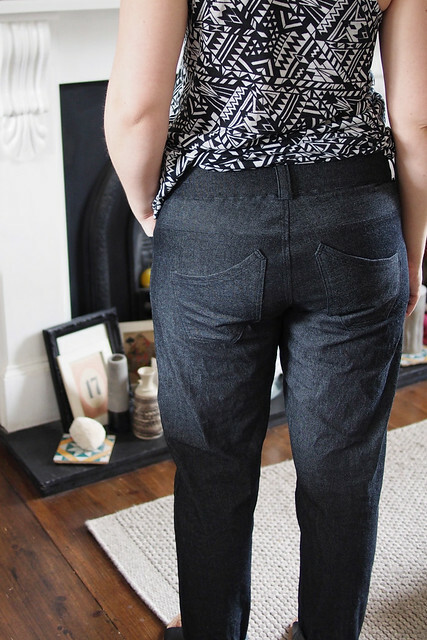 These are my Minerva blogger network project for April, and I used their 100% cotton 7.5oz black denim, which is a great basic light-medium weight denim with no stretch but a bit of ‘give’. The pattern I used is Burda 6798, a ‘boyfriend’ type style with a low waist, shaped back pockets, front hip darts, and options for either a buttoned or zip fly. Generally Burda patterns fit well on me out of the packet, and this wasn’t an exception. I cut a 14/40 to account for my hip size but ended up sewing the outer seams with a very large seam allowance as they turned out too big, so I’d say size down if you’re on a cusp. I graded down to the second-smallest size below the knee to slim the calves and ankle down, and took 2″ off the length. I’ll just take this opportunity again to say if the fitting part is putting you off sewing trousers – don’t let it! Honestly, I think I’m making so many pants at the moment because I find them so much easier to fit than dresses. They’re also much simpler to baste and adjust as you go without needing to worry about lining or fastenings. And I don’t even have a straightforward lower half to fit, since there’s a 13″ difference between my waist and hip. Pants sermon of the day over! 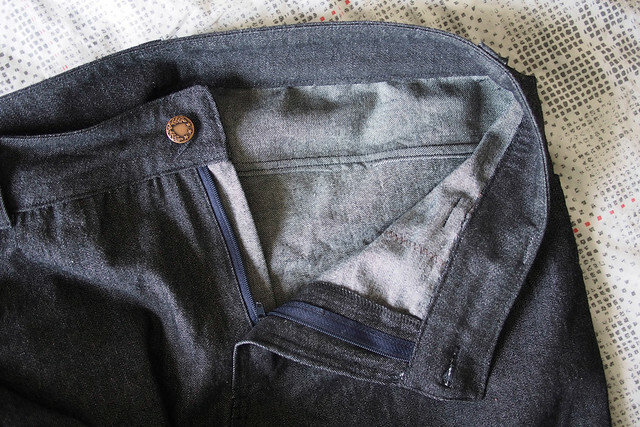 Pleasingly the curved waistband and back yoke of the 6798s fits perfectly with no fiddling – no gapeage at all to deal with. Burda pants patterns are constructed in such a way that it’s easy to alter the back seam right up until the end though, so you can adjust on the fly for a perfect fit. 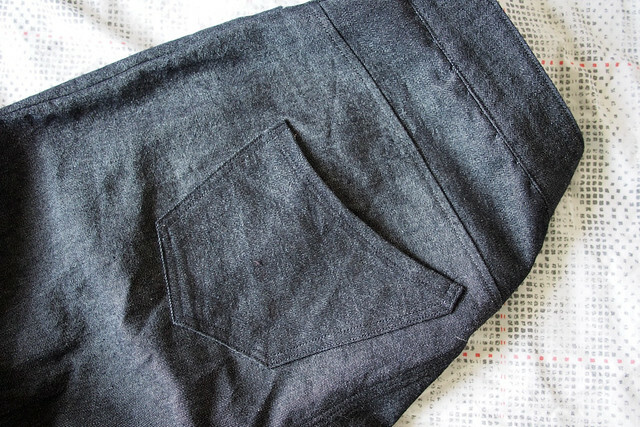 The back pocket shape is a fun change, and I really like where the low waistline hits. The slight puckering you see below the waistband, by the way, is partly because I eased in the waistband tightly to keep it snug and partly because I hadn’t removed the hand-basting I always do to secure the inner waistband before topstitching. I’ve taken it out now and the puckers have smoothed themselves out with a bit of wear. I didn’t use the instructions at all because I’ve made so many jeans now I have my ways, ha. I cut-on the fly extension piece and sewed the fly per the Ginger instructions. I do however really like how Burda do the pocket stay/holster, it’s less bulky since just one layer goes right to the fly. I flat-felled the yoke and inseam and serged the other seams. I haven’t really worn non-skinny jeans for ages, so I’ve been gathering some ideas for how to wear these. 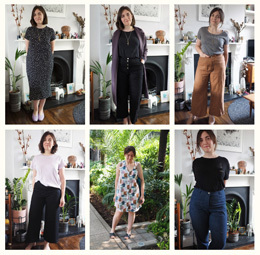 I think they look best with the cuff rolled to show a bit of ankle, so any day it’s warm enough that’s how I’ll wear them – here’s how I wore them on a slightly cooler day. I wouldn’t be surprised if I end up making another pair of these sometime – they’re in regular rotation already, being super comfortable, cycle-friendly and fun to make to boot. Awesome jeans. I like this relaxed fit of this style. Great outfit in the last photo. I really want to be good at making trousers and jeans. These look great on you, I have made the Style Arc Misty jeggings which were easy and fit well with a few minor adjustments. 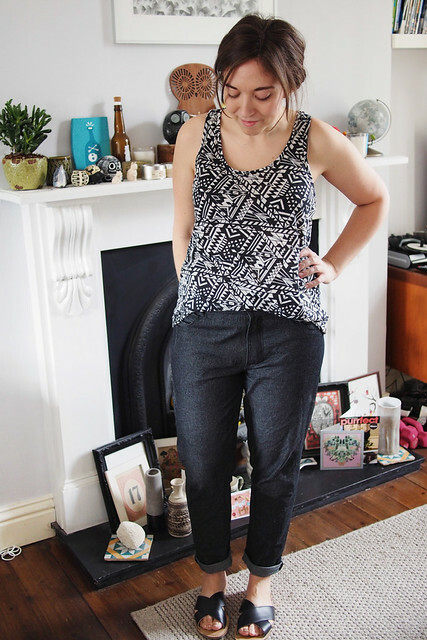 Not tried the Ginger jeans yet, my next project is a denim jumpsuit! Trousers are so hard when you have a curvaceous rear! Oooh, nice! It’s fun to see another jeans pattern get used – I”m debating if I’m going to make my next pair of pants yet more Gingers, or go back to my fav Style Arc pattern just to shake things up. Can I ask how Burda does the pocket stay? I’m curious! You can sort of see it here (though I messed this pair up and cut the extension too short!) https://farm6.staticflickr.com/5555/14090415954_1919998368_c.jpg Basically the pocket ‘holster’ piece extends to the fly, holding them in place and keeping the stomach area snug. They’re very cool. I like the little cuff and more relaxed look! Very summery. They’d look great in non-denim too for summer – Like a chambray linen. Hell yeah, or chino type fabric. I really don’t need more pants now…! These look awesome! I definitly want some cropped boyfriend jeans for the summer so I’ll keep this pattern in mind. I’m actually hoping to modify the Ginger pattern a bit to see if I can make that work, because it just fits so well. 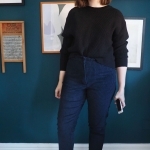 You totally inspired me to try sewing pants – you always seemed to have such good success, and I totally agree the fitting isn’t as tricky as one might think. They are fantastic. I love this silhouette. 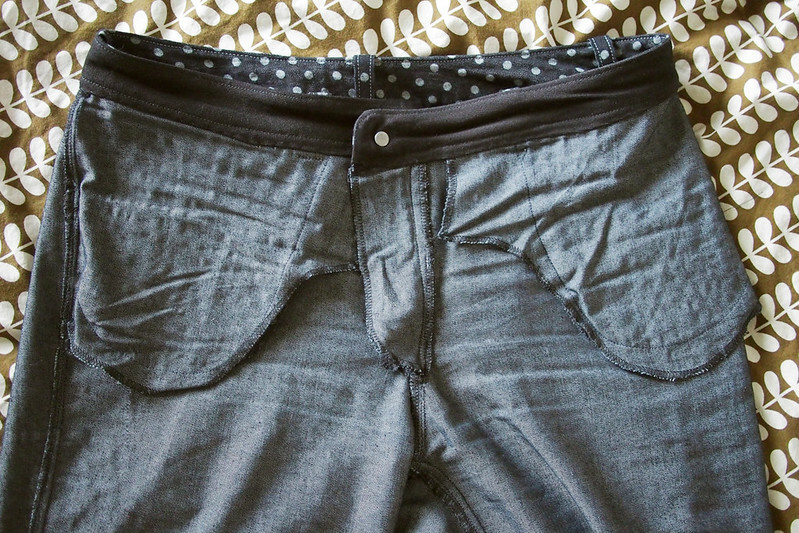 I’m kind of over skinny jeans at the moment, but you can’t seem to find anything else nowadays. 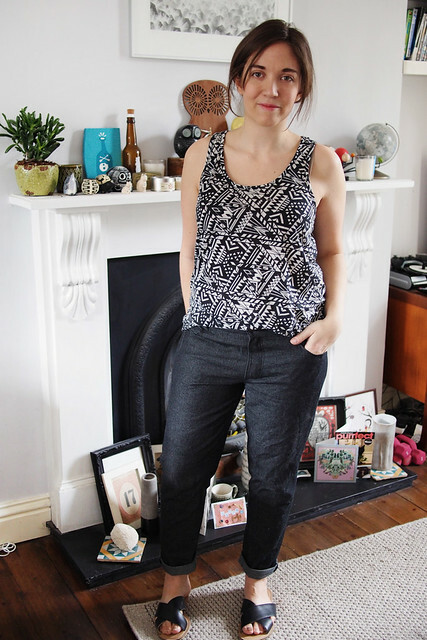 Now, I don’t really need any more jeans but I love sewing them! They look great – especially like the relaxed style and the funky pocket. Well done you! I love them! I stil can’t master basic trousers let alone jeans! These look terrific! I was very curious about this pattern, and I’m so glad to see they turned out so well. I love this style on you! I know, I know. Get on amd make some trousers! Maybe this should be my thing for me made may – to make and fit a pair! These look great. Nice to have a change from skinniest! Don’t think I can! I’d love a lighter denim pair but prints would be really fun for summer too. Such nice jeans! 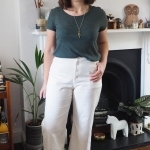 It’s so great to hear someone else say how simple trousers/jeans are to fit – I have just finished a muslin of some trousers and totally agree! 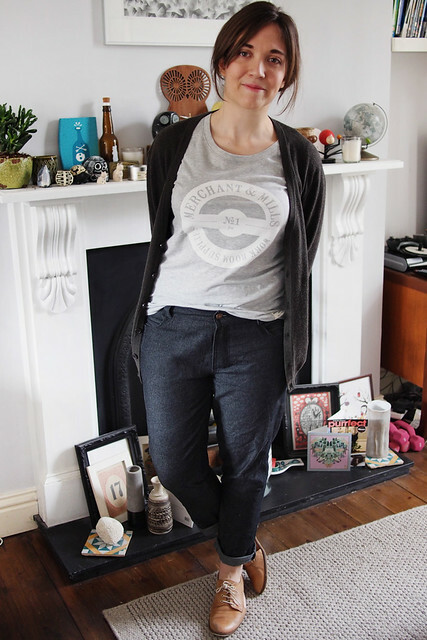 These look great – I love them with the brogues. I was cycling into work today thinking I need some boyfriend jeans, and then this post pops up in my feed! I’ll definitely be considering this burda pattern! I was always cautious about the perceived amount of work going into jeans making, but I have now made my first pair and I’m hooked on the process. I agree with you on fitting pants. (Actually, I didn’t know I was supposed to be scared of them until quite recently.) To be fair, I’ve had my share of unwearable pants, but usually my homemade pants fit far better than RTW ones. Love these jeans! They fit beautifully and are very well sewn. Yeah I think you need to take jeans in stages, but I’ve grown to really love the whole process. Thank you! Thiose pockets!! To die for! I am encourage to try more trousers thanks! Yours looks awesome! Pingback: Spring Sewing Trends with Kelley | Sew Mama Sew | Outstanding sewing, quilting, and needlework tutorials since 2005. VERY cool pockets. I think I’ve got the same denim for a completely different project for July! I haven’t been able to get this pattern out of my mind… Can I just ask how low rise they are? I would need to make them high(ish) rise so I wonder of much of a way to go threre is. They hit just below my belly button, so I’d call them mid-low rise. They don’t fall down and they do cover my tummy, so perfect for me. Oh, that sounds great, that could well be high enough for me too. Will scout for suitable denim at tomorrow’s fabric market :-)! Hi, they are fantastic and fit really well. I have this pattern (a purchase completely inspired by yourself!) and I was wondering if you kept the front pockets darts? Thankyou.